Over the last 7 years, we’ve collaborated with Pádraig Ó Tuama in offering this urban retreat series at Advent in Glasgow’s city centre. This is the now the 8th glorious occasion. The ‘Three Marys’ have been characters upon whom Christianity has long hung archetypes: Virgin, Bossy, Prostitute. 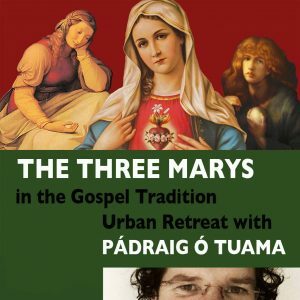 During this urban retreat, Pádraig will help us explore the stories of these extraordinary women in the texts, in our own lives and in poetry, reckoning with the richness of their characters and reflecting on the need to archetype powerful women characters of the gospel tradition. Come prepared to read stories in new ways, to blush a little, and to make friendships with new people and with the three Marys.